There are kaya toasts. And then there are kaya toasts. With so many food establishments serving up kaya toast, most notably Ya Kun Kaya Toast and Good Morning Nanyang, popular establishments that try to give a fresh spin on traditional eats, offering options such as Cheezy French Toast with kaya and Orange Ciabatta Kaya Toast. 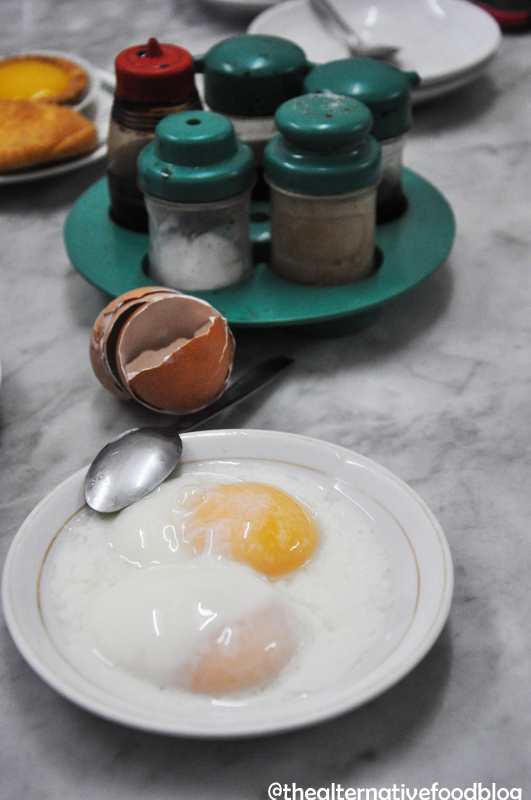 Admittedly, I would just head to Ya Kun for my regular kaya toast and soft-boiled eggs fix. 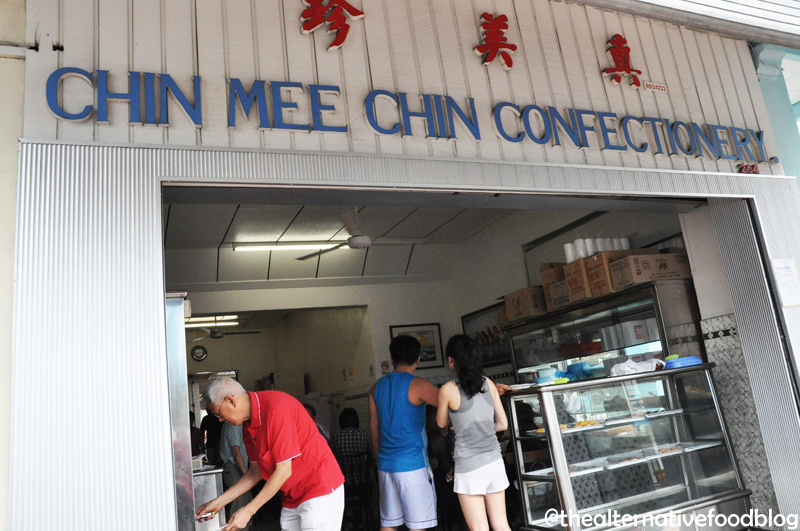 I was drawn to Chin Mee Chin, a Hainanese establishment, because of the myriad of blog posts reviewing its famed confectionery and kaya toast. Given my Hainanese roots, I was curious to see what the standard of food served there was. Determined to beat the crowd, Kit, Shereen and I dragged ourselves out of bed at 7am on a Sunday morning to pay Chin Mee Chin a visit. Being the kiasu Singaporeans we are, we arrived at 8.30am, just as they opened for business. Several tables were already occupied by the time we arrived, save for an empty one, which we immediately made a beeline for. Chin Mee Chin works on a semi-self-service basis. You choose whatever cake or confectionery that’s on display (these range from sugee cakes to chocolate cupcakes; they’re the old school type of cakes, nothing fancy like the ones we’re used to, but it doesn’t matter, as long as it tastes good, right? ), head back to your table and chow down on these while you wait for the rest of your order to arrive. One of the staff will then come by and give you a hand-written bill which you can then take to the cashier to make your payment. Between the three of us, we ordered a custard puff, a custard egg tart, a chocolate cupcake, a set of kaya toast, a pair of soft-boiled eggs, two cups of coffee and a cup of milk tea, all at a price of $8.50. The highlight of our visit to Chin Mee Chin was definitely their signature Kaya Toast. It was fragrant, rich and its consistency was just right. In fact, I’d go as far as to say that Chin Mee Chin has perfected the art of making the humble kaya toast. It doesn’t resemble a toast per se since it’s served on a bun a la Gardenia’s butter roll. It is split in half, on which a generous amount of kaya is spread, topped with a slice of butter. The best way to eat this is to eat it like you would a burger – bring both buns together and chomp away. 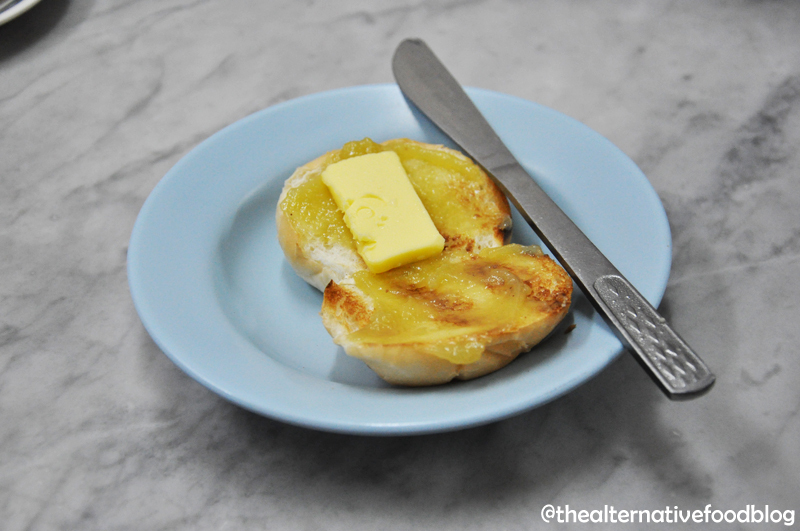 The kaya was smooth and you could taste the richness of the eggs, while the bread was soft, warm and fluffy, which allowed the butter to meld with the kaya. Next up, we had the Soft-boiled Eggs, which was served as it is. You have to crack it yourself unlike places like Ya Kun, where the eggs are cracked for you. However, that wasn’t much of a problem. The eggs were fresh, perfectly runny and surprisingly large. Of the condiments provided, the light soy sauce, when drizzled over the eggs, makes for the perfect weekend breakfast eggs. We also tried the Custard Puff, which I felt was a little dry. Despite the dryness of the pastry, the custard was neither too sweet nor rich, and I loved every bit of it. I would’ve been happier had the pastry been a little more moist. The Egg Tarts, which looked so inviting on the display, turned out to be a bit of a disappointment, perhaps because we were not used to the type of shell they used. It was fragrant, but a tad bit dry, presumably because it was thicker than the shell used in fruit tarts. The custard, however, was delicious. 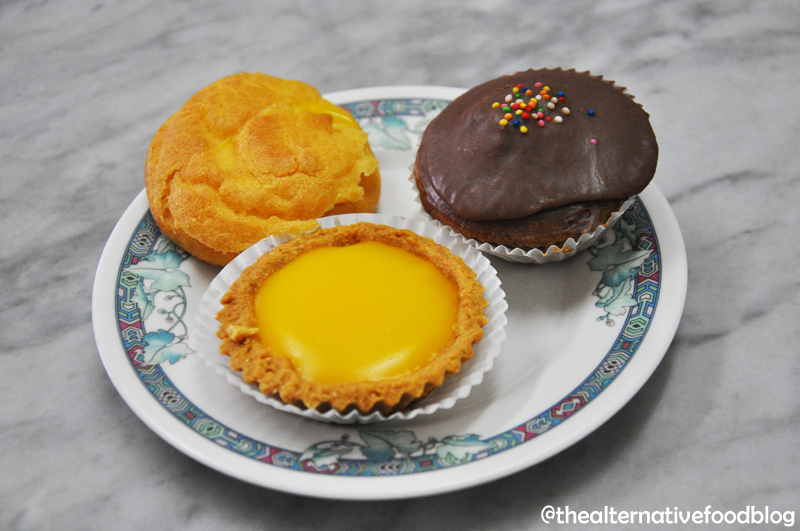 The cupcakes sold at Chin Mee Chin are of the old school variety, unlike the fancy ones that are all the rage these days. We had the Chocolate Cupcake which was fluffy, albeit a little dry. Kit thought the icing was a little sweet for her taste, but overall it was a nice change from the calorie-laden ones sold everywhere else. The beverages we had were not bad; the coffee the girls ordered had just the right amount of condensed milk, which didn’t render it cloyingly sweet, while the milk tea I had was fragrant and not too sweet, which complemented the richness of the kaya toast, and it was a pleasant way to end off the meal. Vegetarian options: Cakes, pastries, and plain kaya toasts are suitable for Ovo-lacto vegetarians. This review was written by our guest reviewer Cheryl Han, who joined us for our cafe experience at Chin Mee Chin and Dong Po Colonial Cafe.